Apartamento vacacional con acceso directo al jardín y la piscina. El apartamento tiene 3 dormitorios, 1 baño, wc separado, cocina / comedor / sala de estar de planta abierta con puertas a un patio para comedor y barbacoa. Lavandería completa. Aire acondicionado a todas las habitaciones. Suelos de baldosas, bien equipadas con lavavajillas y nevera / congelador. El apartamento cuenta con instalaciones wifi y está en una excelente ubicación para acceder a las playas de Cairns y al centro de la ciudad. Margaret Street es un callejón sin salida muy tranquilo en el centro de Redlynch Village, que se encuentra a 15 minutos en coche del distrito financiero de Cairns. A un corto paseo de las tiendas locales, los restaurantes y la tienda de botellas del Red Beret Hotel. 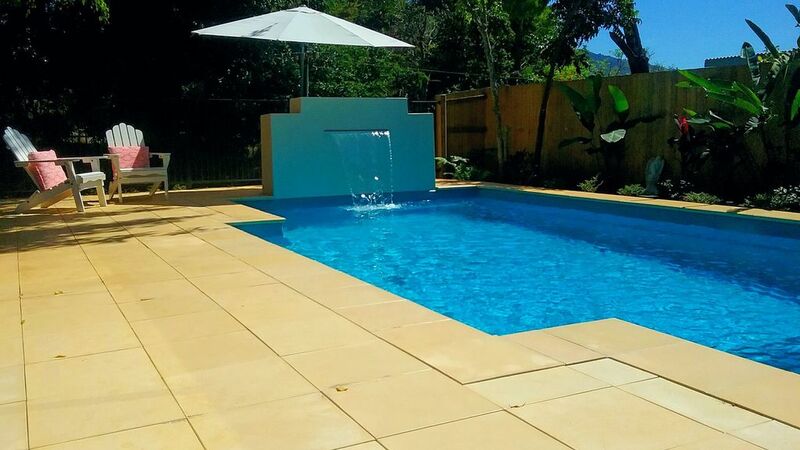 A very pleasant location in a quiet residential area just outside Cairns - about a 20 min drive from the city centre and its facilities with a hire car. Laundry facilities work well, the kitchen is a little dated, but the apartment has plenty of space and comfortable covered outdoor living area backing out onto the garden, with a pool that is lovely for cooling off in! Fabulous house, Margie you've thought of everything to make a stay comfortable. The weather was wonderful for the first few days, now we know to visit during winter season! Overall my stay was amazing! Loved every bit of the property. Thanks for being a wonder full host and having us at your property! Hope to visit again in the next year. A great space to chill out in cairns. Margie is a great host and was very helpful. We arrived late but we were warmly welcomed with some little treats. The accommodation was perfect for us and our adult children. Stylishly decorated and spacious. The location was great just down the road from several tourist spots and a short stroll to the classsic Red Beret Pub. The garden and pool were great, we waved to the tourist train at the bottom of the garden and enjoyed sitting out in the courtyard. At night we enjoyed listening to the curlews calling. A great space to chill out in cairns, highly recommend to anyone looking for holiday accommodation in the region. Thanks Margie for being a great host and flexible to our needs. Great open house with a great pool to relax in. The property is beautifully maintained, clean and spacious with a great yard, clubhouse and trampoline for kids. Nicely stocked for self catering. We arrived late and Marg made sure that we were looked after, showed us around and even stocked in some breakfast staples. Highly recommend this location to anyone looking to stay. It is central to Cairns city, Skyrail and easy access to restaurants, bottle shop, shops and local pub. Thanks Jacquie - so glad you enjoyed your stay.